MIT scientists have worked out how to encase vaccines in nanoparticle shells–creating nanovaccine delivery systems, a trick that could have serious implications in fighting difficult-to-kill viruses like HIV. MIT scientists have worked out how to encase potent vaccines in nanoparticle shells–creating nanovaccine delivery systems, a trick that could have serious implications in fighting difficult-to-kill viruses like HIV. We’ve seen a number of stories concerning nanotech and micro-tech monitoring devices and medicine recently, but this innovation is much more front line. Vaccine design in modern therapy often centers on provoking the body’s T-cells–key players in the immune system–to act to attack a virus or bacteria. Synthetic vaccines (artificially constructed at a molecular level, versus using a “disabled” live virus) are sometimes used when the target vaccine is dangerous or difficult to work with, such as HIV. In the case of HIV, the virus also works largely inside a victim cell–making it tricky to reach, and requiring the activation of very specific T-cells, killer ones. The difficulty in traditional virus treatment is that synthetic vaccines don’t necessarily cause strong T-cell reactions. Scientists have tried wrapping them in fatty liposomes so they look more like “real” viruses, thus provoking the body’s immune system. This approach has its own flaws–the liposomes aren’t stable, and don’t remain long. Enter MIT’s researchers at the Institute for Integrative Cancer Research. By wrapping artificial vaccine molecules in spherical shells of liposomes, they’ve created a stable structure that lasts longer inside the body. But when it’s absorbed into a cell, the liposomes break down quickly, baring the virus and causing the body to create the right kind of T-cells. 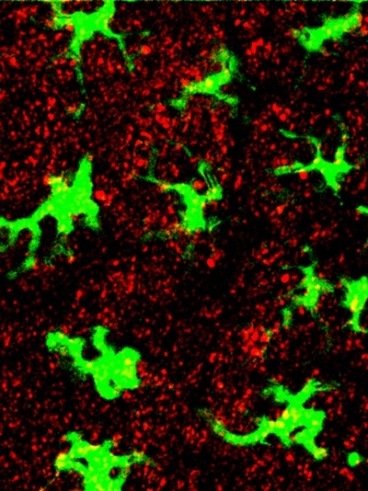 The tech’s been tested successfully in mice, and worked to convert large numbers of T-cells to act as vaccine initiators–as shown in the image, where red nanovaccine particles are surrounding green-stained immune cells. Essentially the trick in this tech is to take some already clever anti-viral biology, disguise it in a sci-fi-sounding nanotech suit that helps it look like a virus, and deliver the vaccine right into the cells where it’s needed. Ninja-nanotech-vaccines perhaps?